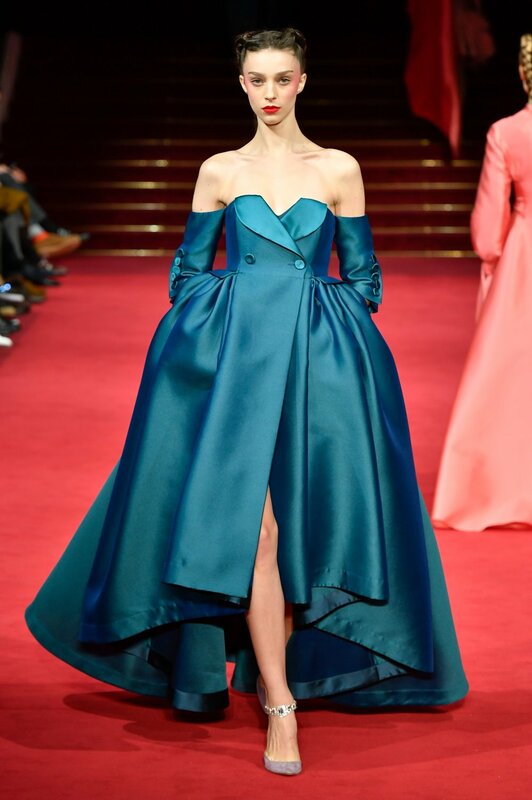 Alexis Mabille’s show notes for his Spring 2018 Couture collection opened with a single quote: “The most beautiful quality is to be yourself and own it.” With this in mind, the French couturier sent down the runway an intentionally disparate collection with bulbous tulip-like dresses alternating with big ruffles and straight lines to show a variety of feminine looks that would appeal to a variety of women. 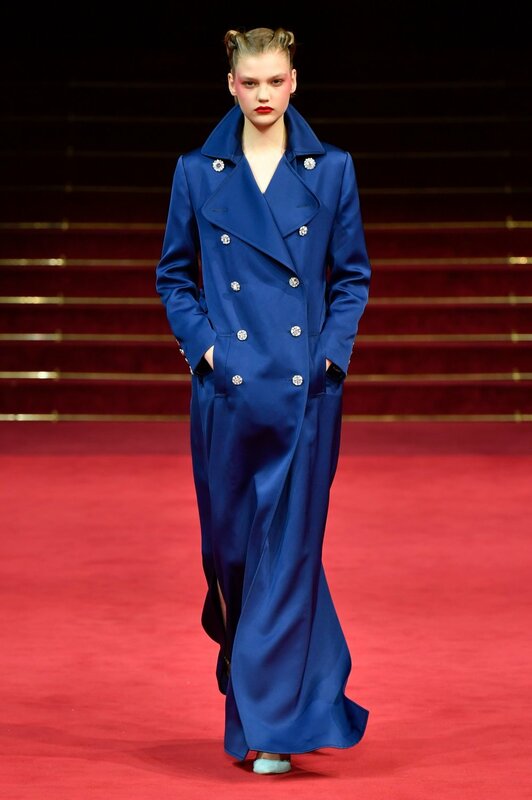 The show opened with an ultra-long, straight peacoat dress in navy leather satin with crystal buttons, a reworking of the navy coat, then moved to a loose monastic shirt dress with white satin bib and a puffy shirt in white radzimir with tiered ruffles worn inside pants with embroidered baguette. 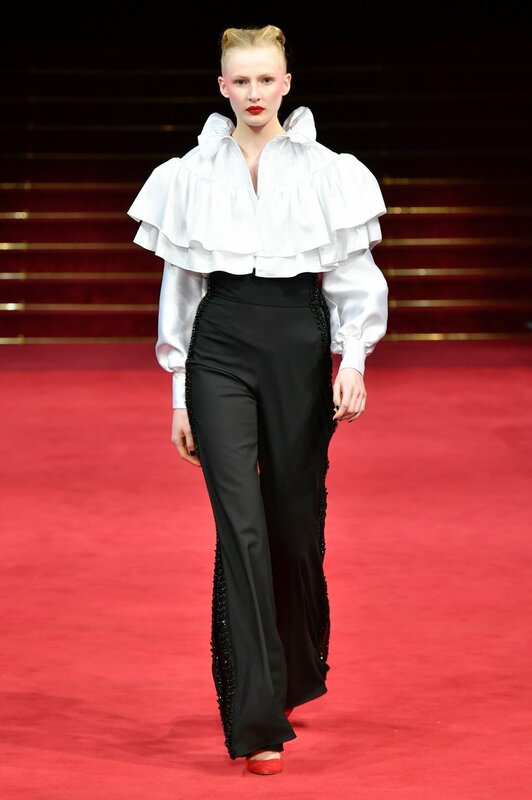 Long tuxedo wrap dresses, trench dresses in lamé brocade, long, oversized dresses, or elegant shirt dresses with a sleeve belt, the collection offered many different structured looks, united by the use of leather, satin, and crystal, as well as a recurring shimmering lamé brocade. For clients who like drama, there was a stunning bustier dress in emerald green duchesse satin and an large tunic dress in emerald silk crêpe with square neckline in invisible tulle, a shirtdress in black crêpe sported striking draped bow sleeves, while bows — a favorite motif of the designer — also appeared on hips or bustiers. Mabille eschewed the traditional final wedding dress to offer instead a beautiful corolla wrap dress in rhodium cassimere (wool fabric) a wide, asymmetrical neckline embellished with a large flower on the shoulder and black ribbons. An elaborate design fit for a modern couture client.